FAQs in Interventional Radiology provides experienced individuals from academic and private practices to share their favorite technical and clinical pearls with colleagues. Each chapter opens with a series of top practice pearls related to its topics, followed by questions and answers. 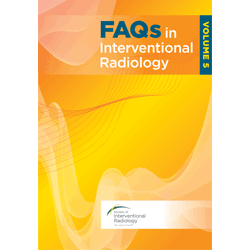 These FAQs will give IRs techniques and approaches to the clinical, imaging, and technical aspects that are crucial to a successful practice, but are not found in journals or textbooks.